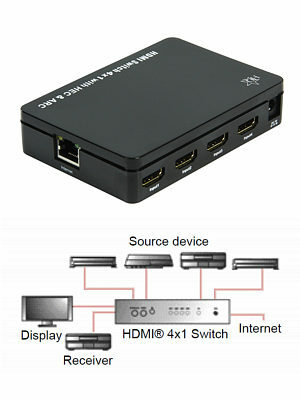 4 Port HDMI Switch High Speed with Ethernet, ARC and 3D Support. 4 input 1 output switch for HDMI signals. Ethernet Connector to connect internet: 1 x RJ45 female. Output connectors: 1x HDMI type A 19pin female. 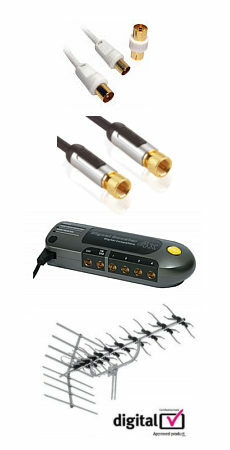 1x Optical TOSLink Audio Return Channel. High Speed HDMI with Ethernet and Audio Return Channel (ARC). HDCP 1.2 compliant: any switch must pass HDCP data between source and monitor. Operation function: Push button or remote control. Supports: up to Full HD 1080p, 24 fps & 50/60 Hz. Supports all 3D formats, including 1080p@23.98/24 Hz, 720p@59.94/60 Hz/50 Hz, bandwidth up to 225 MHz. Supports Audio Return Channel (ARC) from sink device. Connect ARC port to amplifier receiver (only functional on port 1). Plug and play. No software installation required. Installs in minutes. Connect up to 4 different HDMI devices to a flat screen. The included remote control and buttons on the front panel, enable you to change the desired input device. A LED indicates which source device is selected. The switch supports High Speed HDMI and is fully compatible with 3D technology, internet connection and Audio Return Channel (ARC). Supports HDR, HDMI 2.0b & HDCP 2.2 content protection Ideal for Ultra HD 4k 60Hz High speed with ethernet premium certified 28 AWG Copper conductors Anti-corrosive gold plated connectors Blue with black stripe braided Jacket Supports 3D and Audio Return Channel (ARC) Suitable for all HD resolutions including 1080p and 4k Ultra HD Length 5 metres This Premium range of HDMI cables are ready for todays Ultra HD equipment that include features such as 4K 60Hz, BT.2020 and HDR. They have been ATC tested to Premium High Speed HDMI Cables with Ethernet standards and feature a unique anti-counterfeiting authentication label. The cables are tested to the full 18Gbps bandwidth and undergo a full EMI test. 20m HDMI Cable, High Speed with Ethernet Sharpview Pro 4k Compatible with 3D HDTV and HDCP (High-Bandwidth Digital Content Protection) - the content scrambling standard for modern, advanced digital video displays and DVD players Connectors: HDMI Male/Male, Type A 10 year warranty against manufacturing defects. HDMI high speed with Ethernet. CE Approved. RoHS Approved.